Professor David Payne, the current director of the University of Southampton’s Optoelectrics Research Centre, is due to be given a knighthood in 2013 for his outstanding contribution to the field of Photonics. Professor Payne, who has been working with the university for over forty years, has been at the forefront of both the industry and research of Photonics – which for those of us not as scientifically aware is the science and application of light and electronics. It is his research that has facilitated the use of optical fibres in several areas of day-to-day life. For example in 1987 he was the first to develop a practical optical fibre amplifier, now known as the Ebrium-Doped Fibre Amplifer (EDFA), which today forms a core part of the functioning of the Internet and other everyday technology including mobile phones and ATM cash machines. And this is by no means Payne’s first award for his work; amongst his many achievements are the top prizes for photonics in America, Europe and Japan, the UK Rank Prize for Optics, the highly prestigious US Tyndall Award in 1991 and most recently the Institute of Electrical and Electronics Engineers named him the winner of their 2007 Photonics Award for outstanding achievement. Furthermore he has also been given a seat in the Russian Academy of Sciences – which only has 240 foreign members from across the world. 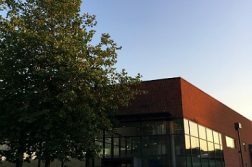 Being one of the UK’s top twenty research-led universities, the developments that have come out of the Optoelectrics Research Centre are typical of Southampton’s cutting edge position in UK academic research. Over the years they have overseen the creation of one of the world’s highest-powered fibre lasers and Professor Payne himself has lead the team which produce fibres used everywhere from life-saving medical devices in hospitals to rockets in outer space.